The leek is a member of the onion family, but unlike the onion, it does not form a bulb. The thick, fleshy stalk is about the same diameter at the base and resembles a large green onion without a bulb. Leaves are flattened like those of garlic. Culture. 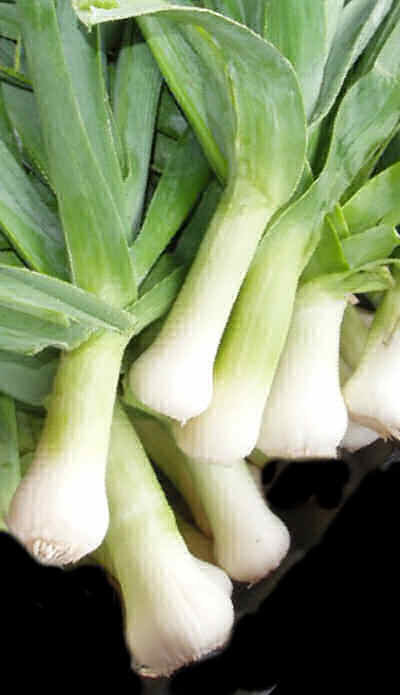 Leeks are grown to be used just as green onions. They need a site with full sun or part shade where they mature in about 130 days, which a fairly long time to maturity. The soil should be well drained and have a pH near 7. Leaks are grown like onions, but they grow to be two to three feet tall. In the fall - plant seeds or transplants during late fall or early winter; fall is best time for seeding leeks. Place each seed about one-half inch deep, two to three seeds per inch. Gradually thin the leeks to two inches apart, hilling up soil to the first leaf notch to keep them white well up the stem. In the spring - or you can set plants out in early spring. Exceptionally hardy, they are best planted as seedlings in May and harvested starting in the late fall. The soil temperature for seeding or planting leek seedlings should be above 50°. And, if the winter weather is reasonably mild, some can be left in the soil, well mulched, to overwinter and provide a good, fresh alternative to onions all the way until next April. When they are about the size of a pencil, till up the soil around the plants to make the edible portion longer and whiter. This is called blanching. Plant leek transplants two inches apart in all directions. Then push soil around the edge up to the first leaf notch to blanch or whiten the stems. Or plant leek transplants into trenches three to four inches deep. As the leeks grow taller, fill in the trenches in stages until the trenches are completely filled in. Leeks are light feeders which means it is easy to give them too much fertilizer. Sprinkle a little bit of granular fertilizer during soil prep and then when planting seeds or seedlings another light sprinkle of organic granular fertilizer; and that is it for the whole season. onion maggots burrow into and destroy the lower part of the leak stem near the bulb. These white maggots are about 1/3 inch long and legless. See controlling onion maggots. they produce and the damage they create. See controlling onion thrips. Harvest leeks after they are an inch or more in diameter, anytime from October until April. Keep them in the soil until you are ready to cook them. Leeks keep for several weeks if maintained at temperatures near 35oF. and a relative humidity near 90 percent. To use the leek, trim the ends, slice lengthwise, and wash thoroughly under running water. Leeks are excellent in stews, soups, and with stir-fry vegetables.